« Doing Right by the Globe-toddling Name. We’re getting itchy feet over here. Extenuating circumstances, both mundane and thrilling, have kept us from putting together any exciting international trips as of late. It’s been a long, long time since New Year’s in Nicaragua. And at the moment, we have nothing international on the books. Fortunately, we found some great books on the international to tide us over: the Global Fund for Children book series. And my kids were enthralled. Part National Geographic, part Mr. Rogers, these books celebrate diversity and global citizenship through easy prose and gorgeous photography. The books are quite simple on the surface: they show kids doing the same things differently around the world. But they beautifully articulate something I’ve struggled to explain to my kids: The things that make us the same make us one big global family. And the things that make us different make us fascinating. 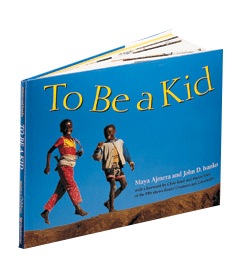 In “To Be a Kid,” author (and Global Fund for Children founder) Maya Ajmera shows children at school, home, and play around the world. Photos from the collection of globetrotting photographer John Ivanko are grouped by activity, so shots of kids doing similar pastimes are arranged in a single spread around a central theme. So, the dancing page shows kids from Ireland, the Philippines, India, the US, and the UK getting their traditional groove on. The ball-playing spread shows baseball in India, kickball in Cuba, futbol in Mexico, and cricket in Antigua and Barbuda. My kids loved spotting the differences in geography, architecture, and dress. But they also loved pointing out the things that they like to do themselves. It didn’t matter if the merry-go-round was in Austria or the pool was in Mexico or the stilts were in Swaziland: they knew fun when they saw it and gleefully envied the kids in the pictures for getting to take part in it. The other two titles, “Be My Neighbor” and “To Be an Artist,” follow a similar format, with the first title focusing on day-to-day life for kids around the world and the latter highlighting the many, many, many ways young people express themselves through the arts. One of the most refreshing things about these books is their effortless lack of discrimination. They put all politics aside, giving equal billing to nations powerful and obscure, wealthy and destitute, familiar and notorious. The books’ wholesome depictions of kids in countries whose names are usually connected with things ominous or tragic (Iraq, Somalia, Yemen, Haiti, Myanmar…) remind us all that families live there. Whatever the headlines may read, childhood goes on the whole world over. Or to put it another way, no matter where you live, kids are kids. As if fostering global citizenship in your children wasn’t rewarding enough, part of the sales of all the Global Fund for Children’s books goes to the fund itself. So as you help your own little one better appreciate his or her place in the global family, you’ll also be helping somebody else’s little one a world away. The Global Fund for Children’s online store has lots of titles not only in the “To Be” series, but in many other age groups and genres as well. Definitely check ‘em out. How have I never come across those books? I’ve always put an emphasis on multicultural books and it’s a good thing since, sadly, my kids have not yet left the country and they are not toddlers anymore. In fact, I’m looking at an overdue library book as I write this called, “Our World, of Water; Children and Water Around the World” Guess I should bring that book back. Guess I should bring my kids somewhere soon, too, and walk the walk.